Pike Place Market is home to nearly 500 residents who live in 8 different buildings throughout the Market. Most of these buildings have been low income housing in the past; however, some of them no longer are, such as the Livingston Baker apartments. The Market is run by the quasi-government Pike Place Market Preservation and Development Authority (PDA). "Pike-Market" neighborhood as represented in the City Clerk's Seattle Neighborhood Atlas. The heavy line on the map labeled "Alaskan Way Viaduct" is part of Washington State Route 99 (SR-99). The unlabeled street inland from SR-99 as it passes the market is Western Avenue. The Market is located roughly in the northwest corner of Seattle's central business district. To its north is Belltown. To its southwest are the central waterfront and Elliott Bay. Boundaries are diagonal to the compass since the street grid is roughly parallel to the Elliott Bay shoreline. As is common with Seattle neighborhoods and districts, different people and organizations draw different boundaries for the Market. The City Clerk's Neighborhood Map Atlas gives one of the more expansive definitions, defining a "Pike-Market" neighborhood extending from Union Street northwest to Virginia Street and from the waterfront northeast to Second Avenue. Despite coming from the City Clerk's office, this definition has no special official status. The smaller "Pike Place Public Market Historic District" listed on the U.S. National Register of Historic Places is bounded roughly by First Avenue, Virginia Street, Western Avenue, and a building wall about halfway between Union and Pike Streets, running parallel to those streets. In a middle ground between those two definitions, the Seattle Department of Neighborhoods' official 7-acre (28,000 m2) "Pike Place Market Historical District" includes the federally recognized Pike Place Public Market Historic District plus a slightly smaller piece of land between Western Avenue and Washington State Route 99, on the side of the market toward Elliott Bay. To some extent, these different definitions of the market district result from struggles between preservationists and developers. For example, the National Historic Preservation Act of 1966 created the Washington Advisory Council on Historic Preservation. Victor Steinbrueck at one point in the late 1960s convinced the Advisory Council to recommend designating 17 acres (69,000 m2) as a historical district. Pressure by developers and the "Seattle establishment" soon got that reduced to a tenth of that area. The present-day historic district designations lie between these extremes. Part of the market sits on what was originally mudflats below the bluffs west of Pike Place. In the late 19th century, West Street (now Western Avenue, angling away from Pike Place) was already a through street running more or less parallel to the shore. Railroad Avenue (now Alaskan Way) was built farther out on pilings; it was not filled in until the 1930s. Nearby piers with warehouses for convenient stevedoring had already been completed by 1905, two years before the Market opened. Looking east from the Elliott Bay waterfront between Stewart and Virginia Streets. The dirt track rising at left is part of Stewart Street. 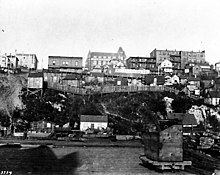 The first Washington Hotel (1891–1906, center, background) sits atop the small, steep Denny Hill, regraded in 1906–1907. This is taken from somewhere near Railroad Avenue, the present-day Alaskan Way. This 1905 Sanborn map, dating from just before the founding of the Market (and before Pike Place was built), shows the heart of today's Market. The intersection near the center of the map is the corner of First and Pike. Before the creation of the Pike Place Market in 1907, local Seattle area farmers sold their goods to the public in a three-square block area called The Lots, located at Sixth Avenue and King Street. Most produce sold at The Lots would then be brought to commercial wholesale houses on Western Avenue, which became known as Produce Row. Most farmers, due to the amount of time required to work their farms, were forced to sell their produce on consignment through the wholesalers on Western Avenue. The farmers typically received a percentage of the final sale price for their goods. They would sell to the middleman on commission, as most farmers would often have no time to sell direct to the public, and their earnings would be on marked up prices and expected sales. In some cases, the farmers made a profit, but just as often found themselves breaking even, or getting no money at all due to the business practices of the wholesalers. During the existence of the wholesale houses, which far predated the Market, there were regular rumors as well as instances of corruption in denying payment to farmers. As consumers and farmers grew increasingly vocal in their unhappiness over the situation, Thomas P. Revelle, a Seattle city councilman, lawyer, and newspaper editor, took advantage the precedent of an 1896 Seattle city ordinance that allowed the city to designate tracts of land as public markets. The area of Western Avenue above the Elliott Bay tideflats and the area of the commission food houses had just been turned into a wooden planked road, called Pike Place, off of Pike Street and First Avenue. Through a city council ordinance vote on August 5, 1907, he had part of Pike Place designated temporarily as a public market for the "sales of garden, farm and other food products from wagons...". 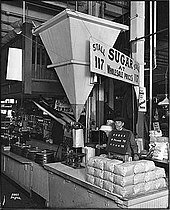 On Saturday, August 17, 1907 City Council President Charles Hiram Burnett Jr., filling in for the elected mayor as Acting Mayor of Seattle, declared the day Public Market Day and cut the ribbon. In the week leading up to the opening of the Pike Place Market, various rumors and stories of further corruption were reported by the Seattle Times. Roughly ten farmers pulled up their wagons on a boardwalk adjacent to the Leland Hotel. The Times alleged several reasons for the low turnout of farmers: Western Avenue wholesale commission men who had gone to the nearby valleys and farms to buy all the produce out ahead of time to ruin the event; threats of violence by commission men against farmers; and farmers' fear of possible boycotts and lack of business with the commission men if the Market idea did not succeed in the long term. Hundreds of customers soon arrived, and before noon that day, all the farmers' produce had sold out. Vegetable vendors selling from Main Arcade daystalls, 1917. Part of the Sanitary Market and Corner Market are visible across Pike Place. In 1907 Frank Goodwin owned Goodwin Real Estate Company in Seattle, together with his brothers Ervin and John. Headquartered in the city's Alaska Building, they owned the Leland Hotel on Pike Street and the undeveloped tracts of land that surrounded Pike Place along the Western Avenue bluff. On the opening day of the Market, Goodwin observed the early morning chaos of farmers dealing with large crowds. Sensing that their land was about to appreciate in value, they began to heavily advertise adjoining plots for sale. Work began immediately on what is today the Main Arcade of the Pike Place Market, northwest of and adjoining the Leland Hotel. Pike Place Market in 2008, as seen from above Western Avenue. The first building at the Market, the Main Arcade, opened November 30, 1907. By 1911, demand for the Market had grown so much that the number of available stalls had doubled, and extended north from Pike Street to Stewart Street, doubling in size since the opening of the Main Arcade. The west side of the stall lines were soon covered in an overhead canopy and roofing, becoming known as the "dry row". The last of the core buildings of the Market for the coming decades was obtained in 1916 by the Goodwins, when they purchased a long-term lease on the Bartell Building at the corner of 1st Avenue and Pike Street. Renamed to the Economy Market, it became an expansion to the Main Arcade. Throughout the early 1920s, the north side of the Corner Market became known as the Sanitary Market, housing delicatessens, butchers, restaurants, and bakeries. The so-called "mosquito fleet", the precursor to the modern Washington State Ferry system, would bring shoppers from various islands in Puget Sound to shop, and Market vendors began to bring goods directly to the docks for sales. Colman Dock and Pier 54 (then known as Pier 3) were within walking distance, and the persons coming to sell their wares at the market would disembark from the steamers at these docks. The area became a social scene, where young Seattle locals went to see and be seen. In September 1920, the Seattle City Council quietly passed an ordinance that farmer's stalls at the Market could no longer be placed in the street, in response to complaints from some local businesses about traffic flow. A public outcry immediately followed from the farmers, merchants, and various citizen's groups. In the midst of the turmoil, the Westlake Market Company pushed itself into the situation, proposing that they would build a two-floor underground market at a building they owned on Fifth Avenue, four blocks from the existing Pike Place Market. The Goodwins, in response, proposed another counter-plan to leverage insurance bonds to finance another further expansion of the Market. As the city government began to quickly lean towards the Westlake proposal, the farmers began to formally organize together for the first time to protect their interests. The deciding Seattle City Council vote in April 1921 was in favor of retaining the existing Market location, and the Goodwins immediately began work on their next expansions. At the time of the bombing of Pearl Harbor in December 1941, many of the farmers selling in Pike Place Market were Japanese-Americans. 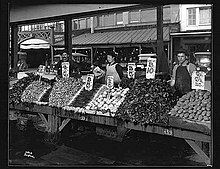 The late Seattle historian Walt Crowley estimated that they might have been as many as four-fifths of the farmers selling produce from stalls. President Franklin D. Roosevelt signed Executive Order 9066 February 19, 1942, which eventually forced all Americans of Japanese ancestry in an "exclusion zone" that included the entirety of the West Coast states and southern Arizona into internment camps. On March 11, Executive Order 9095 created the Office of the Alien Property Custodian and gave it discretionary, plenary authority over all alien property interests. Many assets were frozen, creating immediate financial difficulty for the affected aliens, preventing most from moving out of the exclusion zones. Many Japanese Americans were effectively dispossessed. In 1963, a proposal was floated to demolish Pike Place Market and replace it with Pike Plaza, which would include a hotel, an apartment building, four office buildings, a hockey arena, and a parking garage. This was supported by the mayor, many on the city council, and a number of market property owners. However, there was significant community opposition, including help from Betty Bowen, Victor Steinbrueck, Ibsen Nelsen, and others from the board of Friends of the Market. An initiative was passed on November 2, 1971 that created a historic preservation zone and returned the Market to public hands. The Pike Place Market Preservation and Development Authority was created by the city to run the Market. Over the course of the 1970s, all the Market's historic buildings were restored and renovated using the original plans and blueprints and appropriate materials. In the 1980s, federal welfare reform squeezed the social services based in the Market. As a result, a nonprofit group, the Pike Place Market Foundation, was established by the PDA to raise funds and administer the Market's free clinic, senior center, low-income housing, and childcare center. Also in the 1980s the wooden floors on the top arcade were replaced with tiles (so as to prevent water damage to merchandise on the lower floors) that were laid by the PDA after staging a hugely successful capital campaign – people could pay $35 to have their name(s) inscribed on a tile. Between 1985 and 1987, more than 45,000 tiles were installed and nearly 1.6 million dollars was raised. The 1983 Hildt Amendment or Hildt Agreement (named after Seattle City Council member Michael Hildt) struck a balance between farmers and craftspeople in the daystalls. The agreement set rules that would last for ten years from August 1, 1983, and that would be successively renewable for further terms of five years. The precise formula it laid out stood for over 15 years, and it set the precedent for today's allocation of daystalls, in that it gave craftspeople priority in the North Arcade and farmers priority elsewhere. Victor Steinbrueck Park directly north of the market was originally Market Park. From about 1909 the site held an armory, which was damaged by fire in 1962. The land was taken over by the city in 1968, and the remnant of the armory was razed. In 1970 the land passed to park usage. The resulting Market Park was largely redesigned in 1982. It was renamed in 1985 after the late Victor Steinbrueck, who was instrumental in the market's preservation. In 1998, the PDA decided to end the Hildt Agreement. While their proposed new rule to allocate daystalls was generally seen as more favorable to farmers, there were both farmers and craftspeople who objected, especially because the PDA's timing gave them little chance to study the changes. At their last meeting before the August 1 deadline, the PDA voted 8–4, to notify the city of its intent not to renew the Agreement. The City Council did not accept the proposed substitute. The council and PDA extended the Hildt agreement 9 months and the council agreed to an extensive public review process in which the Market Constituency played a major role. The public meetings did not result in a clear consensus, but did provide enough input for city councilmember Nick Licata to draft a revised version of the Hildt Agreement. Adopted in February 1999, it became known as the Licata-Hildt Agreement. The bad blood generated by the conflict spurred an audit of PDA practices by the City Auditor; the audit was critical of the PDA for occasionally violating the spirit of its Charter, but exonerated it of any wrongdoing. Pike Place Market celebrated its 100-year anniversary on August 17, 2007. 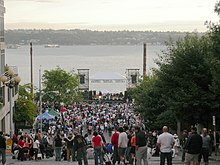 A wide variety of activities and events took place, and a concert was held in Victor Steinbrueck Park in the evening, consisting entirely of songs related one or another way to Seattle. The "house band" for the concert called itself The Iconics, and consisted of Dave Dederer and Andrew McKeag (guitarists of the Presidents of the United States of America or PUSA); Mike Musberger (drummer of The Posies and The Fastbacks); Jeff Fielder (bassist for singer/songwriter Sera Cahoone); and Ty Bailie (keyboard player of Department of Energy). Other performers included Chris Ballew (also of PUSA), Sean Nelson of Harvey Danger, Choklate, Paul Jensen of the Dudley Manlove Quartet, Rachel Flotard of Visqueen, Shawn Smith of Brad, Stone Gossard and Mike McCready of Pearl Jam, John Roderick of the Long Winters, Evan Foster of the Boss Martians, Artis the Spoonman, Ernestine Anderson, and the Total Experience Gospel Choir. In 2008, Seattle voters approved a six-year property-tax levy to fund critical repairs and improvements. Basic infrastructure was failing and the nine-acre site had fallen well behind standards for safety, accessibility and environmental stewardship. The architecture firm SRG Partnership was hired to design the renovation. Completed in 2012, the renovation was designed to preserve the character of the campus while giving the buildings comprehensive upgrades that achieve full compliance with City codes and standards. The Pike Place Market is overseen by the Pike Place Market Preservation & Development Authority (PDA), a public development authority established under Washington State law. It is overseen by a 12-member volunteer council. Its members serve four-year terms. Four members are appointed by mayor, four by the current council, and four by the Pike Place Market Constituency. The Market PDA sets the policies by which the Pike Place Market is managed and hires an executive director to carry out those policies. Established in 1973, the PDA manages 80% of the properties in the city-recognized Market Historical District. Its founding law—the Market Charter—requires it to preserve, rehabilitate and protect the Market's buildings; increase opportunities for farm and food retailing in the Market; incubate and support small and marginal businesses; and provide services for low-income people. PDA revenues derive from the Market's tenants through rent, utilities, and other property management activities. The same 1973 charter that established the PDA also established the Pike Place Market Constituency. The Constituency elects one member to the PDA Council each year. Anyone 16 years of age or older who lives in Washington State can become a member of the Constituency by paying $1 yearly dues. Operating independently of the PDA, the Market Historical Commission (established by the 1971 initiative to preserve the Market) has the specific mandate to preserve the Market's physical and social character as "the soul of Seattle." The commission must approve any substantive change in the use or design of buildings and signage in the Historical District, even when these actions are taken by the PDA itself. Members of the 12-member commission are appointed to three-year terms by the mayor. At any time, the commission consists of two members each from the Friends of the Market, Inc., Allied Arts of Seattle, Inc., and the Seattle chapter of the American Institute of Architects; two owners of property within the district; two Market merchants, and two district residents. They meet 22 times a year. The Seattle Department of Neighborhoods provides them with a staff person, and the city's Department of Design, Construction and Land Use (DCLU) can enforce their decisions. Another key organization in the affairs of the Market is the Pike Place Merchants Association. Officially incorporated in 1973, it traces its history back to the Farm Association established in the 1920s. The association connects market vendors to legal, accounting, bookkeeping, business insurance, and health insurance services and provides free online advertising for its members. It also represents its members and attempts to advance their interests and opinions. All PDA tenants are required to be members; daystall vendors also have the option to join. Since 1974, the association has published the monthly Pike Place Market News, which promotes the Market and its neighborhood. For over three decades, the association sponsored a Memorial Day fair at the market; financial difficulties caused cancellation of the fair in 2004. A separate Daystall Tenants Association (DTA) formed in the late 1980s to represent the specific interests of daystall vendors. The DTA formed in response to proposed increases in daystall rental rates. Most members pay a $2 annual membership fee; the fee is optional. The DTA meets on the Desimone Bridge in the Market at least once each quarter. Similarly, the United Farmers Coalition (UFC) formed in 1998 to represent daystall farmers who sell produce, flower, and processed food; the UFC represents only these food vendors, as against craft vendors. 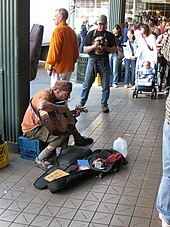 The Pike Market Performers' Guild, founded 2001, represents Market street performers. Among its members are Artis the Spoonman and Jim Page. Friends of the Market, which spun out of Allied Arts in 1964 and over the next seven years spearheaded the activist work that saved the Market is no longer a driving force in the Market. Still, as noted above, they have two seats on the Historical Commission. They also give tours of the Market. The Market Foundation (established 1982) was founded to support the Market's services for low-income people. The foundation now also supports heritage programs, improvements and repairs to historic buildings, and programs that assist the Market's farmers. The City Auditor's office has stated that there is an "inherent conflict... between the PDA's need to operate the Market as a successful business entity and its Charter obligation to support small owner-operated tenant businesses." A fishmonger's stall in the Main Arcade. Open-fronted, but rented on a lease, not as a daystall. Language barriers also play a role. 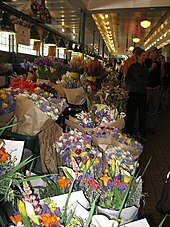 For example, most of the flower vendors in the Market are Hmong; during the difficult negotiations in 1999 over replacing the Hildt Agreement, many were apparently under a misimpression that the proposed agreement would have halved the vending space they received for a day's rent; in fact, this was unchanged. Further, the farmers who were the Market's original raison d'etre do not necessarily do well when the Market becomes more of a tourist attraction than venue for shopping for produce and groceries. "Craft vendors, antique and curio merchants, and booksellers…" wrote the City Auditor's office, "derive much of their business from tourists; fresh food vendors do not." Conversely, farmers have far more selling opportunities outside the Market than in the early and mid-20th century. As late as 1990, there were about ten farmers markets in Washington. By 1999 there were more than sixty. Most are seasonal weekend markets without most of the Pike Place Market's amenities, but they are not swarmed with tourists, parking is free or inexpensive parking and relatively plentiful, and food is the main focus of those markets, not crafts or flowers. The Market's "Meet the Producer" mandate now includes craftspeople as well as farmers. Both can rent daystalls. Farmers take historic precedence, but the PDA "acknowledges the rightful and permanent position of handmade arts and crafts as an integral use of the Market's Daystalls" and their rules seek to encourage a lively mix. 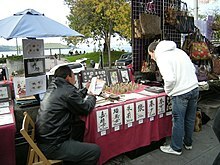 Some grandfathered vendors are allowed to sell merchandise not of their own making on essentially the same terms as craftspeople. Currently, there are rules to make sure that new crafts vendors demonstrate themselves to be skilled craftspeople making their own wares with minimal use of assistants. A standard Farm Table consists of two adjacent daystalls; a standard Craft Table is a single daystall. Daystalls are between 4 feet (1.2 m) and 5.5 feet (1.7 m) wide. Craftspeople have priority on the Desimone Bridge, the west side of the Market arcade north of the Desimone Bridge and the outdoor slabs between the arcade and Virginia Street; farmers have priority everywhere else. If farmers do not fill their priority tables, craftspeople may rent those, and vice versa. Priority is further set by separate seniority lists, one for farmers and one for craftspeople. For farmers, other factors besides seniority come into play, mainly how often the person sells at the Market. Farmers can pass permits through their family. The rules for joint and family crafts businesses are far more complex. While farmers and craftspeople may make some use of agents to sell on their behalf (including vendors functioning on different days as one another's agents), in order to maintain their seniority farmers must be physically present one day a week and craftspeople two days a week. To sell on a Saturday, vendors must sell at the Market a minimum of two weekdays of the preceding week. There are also allowances for taking vacations and sabbaticals without losing one's seniority. Senior Crafts Permit Holders—craftspeople who have sold in the Market for 30 years or more—need only rent (and use) a daystall once a week to maintain their seniority. The definition of permitted farm products includes (among other items) produce, flowers, eggs, cultivated mushrooms, meat, cultured shellfish, and dairy products. There is also a broader category of supplemental farm products such as wild-harvested berries and mushrooms, non-edible bee products, or holiday wreaths. These may be sold in conjunction with permitted farm products, but there are strict limitations to prevent these from becoming anyone's primary products. Rules vary significantly at different times of year. Farmers, craftspeople, and performers all must pay for an annual permit. As of 2008, the fee is $35 for farmers and craftspeople, $30 for performers. Craftspeople who vend off season—January through March—pay an additional $35 for a separate permit. For performers, this annual fee is their only fee. Farmers and craftspeople pay day rent for any daystalls they use. Depending on the season and the day of the week, a daystall may rent for anywhere from $5.85 for a stall on a Monday-Thursday off season to $32.85 on a Sunday in peak season. There are also separate rents for lockers and coolers. Compared to farmers and craftspeople, performers have a lesser role in the Market, but still one formally recognized by the PDA. "The PDA's mission with regard to performers is to maintain locations within the Market where performing artists may entertain Market shoppers in a fashion consistent with and complimentary (sic) to the needs of the Market's commercial business activities and Market residents. Performers may receive donations and may display their recordings for sale, but prohibited from active solicitation of donations and from active sale of "any product associated with the performance". In keeping with their lack of day fees, individual performers are not assigned specific places and times to perform. There are only positions in a (virtual) line for each marked, sanctioned performance location. Queuing runs on an honor system. Each performance is limited to one hour if any other licensed performer is waiting for the spot. Electronic amplification is not allowed, nor are brass instruments or drums. Certain performance locations are further limited to "quiet" performances where (for example) even hand-clap percussion is not allowed. Although they do not have the same strict requirements as for daystalls, most commercial Market merchants are owner-operated businesses. In the 1970s, when the Market was undergoing extensive rehabilitation and the future of the Market was somewhat unstable, the PDA consolidated its merchant base by giving merchant tenants very favorable leases, with longer terms and lower rates than were available elsewhere in Downtown Seattle. This policy was part of the reason that the PDA ran into the financial difficulties that led to its dealings with the Urban Group. The PDA now gives below-market rates only to start-up businesses, businesses or organizations designed to serve low and moderate income persons, and to "the Market’s unique character-defining businesses." The latter include produce, fish, and meat businesses. The PDA often will not renew multi-year leases for businesses with poor sales performance or other problems, but typically will allow them to remain indefinitely on a month-to-month basis. About once a year, the PDA has occasion to refuse to renew when a merchant's lease ends. The Market is also a significant provider of low-income housing and social services. The Market Foundation supports the Pike Market Medical Clinic, Pike Market Senior Center, Downtown Food Bank, and Pike Market Childcare and Preschool (all within the Market), as well as low-income housing in and near the Market. They provide Market Fresh coupons to their low-income tenants, redeemable for Market produce, and implement the FoodLink program that distributes unsold Market produce to other Seattle food banks and meal programs. The money placed in the Market's giant piggybank goes to this foundation, as do the funds raised by several annual or intermittent fundraisers, including Pigs on Parade. About 500 people live in the market. Approximately 90% are low-income seniors with subsidized rents. Their average income is only $11,095 a year. Among the low-income units in the Market are 41 in the LaSalle Hotel, 51 in Market House, 44 in the Stewart House and 96 in the Livingston-Baker. Landes Block, also known as the Hotel Livingston or the Livingston-Baker Apartments. 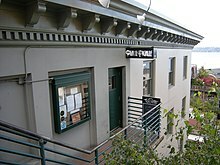 The Pike Market Medical Clinic is in the lower portion of this building, facing onto Post Alley. Part of the Pike and Virginia Building can be seen at right. The Pike Market Medical Clinic provides primary care and ancillary services to 3,600 patients. Most of these are either elderly, HIV-positive, or working poor. One third homeless, 30% are physically disabled, and 60% have severe mental illness and/or chemical addiction. The clinic provides basic medical care, subsidized prescriptions, lab work, mental health counseling, drug and alcohol counseling, connections to other community services, and sometimes even assistance in finding housing. Approximately 900 people use the Market's senior center. Services include hot lunches for low-income seniors, help in finding housing and jobs, and a variety of classes ranging from physical fitness and health to language, geography, art, and computer training. The Downtown Food Bank, located in the Public Market Parking Garage on Western Avenue provides groceries to approximately 1,000 people a week. About 265 bags of groceries are delivered weekly to homebound downtown residents. About 160 families receive infant milk, baby food and diapers. The child care and preschool serves 90–100 families with children ages 2–5 each year. 84% of families with children attending are low-income and receive tuition assistance. Besides its educational aspects, the school provides these children with breakfast, lunch, and afternoon snacks and has a full-time, onsite child and family support professional to identify resources children their families might need and to link them to those resources. One of the Market's major attractions is Pike Place Fish Market, where employees throw three-foot salmon and other fish to each other rather than passing them by hand. When a customer orders a fish, an employee at the Fish Market's ice-covered fish table picks up the fish and hurls it over the countertop, where another employee catches it and preps it for sale. According to the employees, this tradition started when the fishmongers got tired of having to walk out to the Market's fish table to retrieve a salmon each time someone ordered one. Eventually, the owner realized it was easier to station an employee at the table, to throw the fish over the counter. The flying fish have appeared in an episode of the television sitcom Frasier that was shot on location and have been featured on The Learning Channel (TLC) and was also in the opening credits of MTV's The Real World: Seattle. This attraction has also appeared on numerous prime-time installments of NFL games when the Seahawks host games at nearby CenturyLink Field. The first Starbucks Coffee store, founded in 1971, was originally located at 2000 Western Avenue. In 1977 it moved one block away to 1912 Pike Place where it has been in continuous operation ever since. The store was opened by three partners: Jerry Baldwin, Zev Siegl and Gordon Bowker. They were inspired by Alfred Peet of Peet's Coffee to open the store and sell high-quality coffee beans and coffee making equipment and accessories. The sign outside this branch, unlike others, features the original logo – a bare-breasted siren that was modeled after a 15th-century Norse woodcut. It also features a pig statue called "Pork'n Beans," purchased in the 2001 Pigs on Parade fundraiser. Starbucks now owns the Seattle's Best Coffee (SBC) brand, which traces its history back to Stewart Brothers' Coffee, which arrived in the Market several months before Starbucks was founded. On March 8, 2011, the store was the site of a NASDAQ opening bell ringing as Starbucks (which trades on the market as SBUX) kicked off its 40th anniversary. After more than 30 years in the Market, the herbal apothecary Tenzing Momo has become an institution both for obtaining herbs and advice on their use. Founded in 1977, the name (which is Tibetan) means "divine dumpling". Nearby, Market Spice (founded 1911) sells slightly less exotic herbal substances. The Market Heritage Center at 1531 Western Avenue is a small museum about the history of the Market. Pike Place Market's unofficial mascot, Rachel, a bronze cast piggy bank that weighs 550 pounds (250 kg), has been located since 1986 at the corner of Pike Place under the "Public Market Center" sign. Rachel was designed by local artist Georgia Gerber and modeled after a pig (also named Rachel) that lived on Whidbey Island and was the 1977 Island County prize-winner. Rachel receives roughly US$6,000–$9,000 annually in just about every type of world currency, which is collected by the Market Foundation to fund the Market's social services. Rachel provided the theme for the Pigs on Parade fundraiser that was first held in 2001 and was one of several events in various cities modeled on a similar 1998 event in Zurich; the Zurich event centered on cows and was the first of what have come to be known as CowParades. A similar Pigs On Parade fundraiser was held in 2007 on the occasion of the Market centennial, which happened to coincide with the Chinese zodiac Year of the Pig. Since at least the 1960s, Pike Place Market has been known for street entertainers. Besides the aforementioned virtuoso spoons player Artis the Spoonman and renowned songwriter Jim Page, Market performers in years past or present have included steel guitarist Baby Gramps; Johnny Hahn, who routinely hauls around a 64-key spinet piano; retro-jazzer Howlin' Hobbit, who more often settles for an easily carried ukulele; klezmer influenced musicians the Bus Tunnel Bandits, and hoop busker musician Emery Carl, chairman of the Market's Performer's Guild. blind autoharpist and singer Jeanne Towne; Kirsten "Mother Zosima" Anderberg, who for many years sang feminist and other political songs while dressed in a nun's habit; a cappella gospel singers Brother Willie and the Market Crew; the old-timey Tallboys; Johnny Cash sound-alike Vince Mira; the eclectic jazz-tinged sounds and painfully bad jokes of Amber Tide (Thaddeus Spae and his late wife Sandahbeth); alternative-jazz-pop singer-songwriter Alyse Black, and the late folksinger Jim Hinde, a Vietnam War veteran and PTSD survivor. Jump blues musician PK Dwyer is credited with forming the first-ever street band to busk at the Market. He formed that band, Felix & the Freelicks, shortly after he arrived in the Pacific Northwest in 1971. The band evolved into various other alignments, including (successively) the Dynamic Logs, the Jitters, Throbbing Gems, the Royal Famille du Caniveaux / Gutter People of Paris, all of whom played at the Market. Some of these alignments also included Ron Bailey; the Dynamic Logs included Orville Johnson as well. The band, Morrison Boomer, is a more recent staple and known to record live music at the market. The nearly unmarked alley entrance of the Pink Door. While one can easily graze one's way through the Market food stalls and shops, the Pike Place Market offers numerous other eating (and drinking) options. The once endemic workingmen's and sailors' taverns are gone; at roughly opposite corners of the Market, the Virginia Inn (founded as Virginia Bar, approximately 1908; operated as a cardroom during Prohibition, then Virginia Inn; passed into current management 1980 and slowly gentrified) and Place Pigalle (originally Lotus Inn, name dates from 1950s, remodeled 1982) retain their names, but both have gone upmarket. The Athenian Inn in the Main Market traces its history back to a 1909 bakery and is a relatively ungentrified bar and restaurant. Three Girls Bakery dates back to 1912 and may have been the first Seattle business started by women. While it is not in its original Corner Market location, no longer bakes on premises, and its current owner Jack Levy is a man, it still sells a vast variety of baked goods, does a brisk business in takeaway sandwiches, and has an old-style lunch counter. For a different type of dining experience, the Pink Door (founded 1981), entered by a nearly unmarked door on upper Post Alley, is a favorite first-date restaurant, with solid Italian food, a fantasia of a dining room, a bar that sometimes features live jazz, and an outdoor deck overlooking Elliott Bay. Another restaurant combining Italian food and romantic ambience is the Il Bistro, located below grade in the Economy Market, off the winding cobblestones of Lower Post Alley. When it was founded in 1977 it was played an important role in the rise of fine dining in Seattle. Other longstanding Market restaurants and bars include Lowell's (founded 1957), an old Main Market standby self-described as "almost classy"; French bistro Maximilien, founded in 1975 by François Kissel, owned since 1997 by host Axel Macé and chef Eric Francy, and highly praised by Julia Child; and the Copacabana (founded 1964), Seattle's only Bolivian restaurant, upstairs in the Triangle Market with a balcony overlooking Pike Place. Frank Goodwin and his brothers developed most of the core Market buildings. He was largely responsible for the decision to keep ornament to a minimum, in order to keep the emphasis on the products rather than the institution and in order not to scare off people looking for good prices on their produce. Upon his retirement in 1925, his nephew Arthur Goodwin took over most of the Market ownership, selling some shares to people outside of the family. Giuseppe Desimone was born about 40 miles (64 km) east of Naples, Italy. He arrived in America from Italy as a stowaway, but soon became a successful farmer with land in South Park, Tukwila and the Kent Valley along the Green River. A longtime Market vendor, Desimone was one of those who bought shares in the Market in 1925 and eventually became its owner by slowly buying out Arthur Goodwin. He was president of the Market until his death in 1946. Outside of the Market, he is credited with keeping Boeing in the Seattle area in 1936 by selling them a large tract of land for a nominal fee. His son Richard Desimone succeeded him as president of the market and served in that position until 1974. He kept the Market alive in dark times for farmers' markets, doing nearly all business on handshake deals rather than through formal leases. He later served on the Market Historical Commission. Victor Steinbrueck was the leading architect-activist in defining the Pike Market neighborhood, and artist Mark Tobey in visualizing and recording, in developing his "Northwest Mystic" style of the internationally recognized Northwest School of art. Internationally recognized in the 1940s, Tobey explored the neighborhood with his art in the 1950s and early 1960s, as the area was being increasingly characterized by the Seattle Establishment as overdue for urban renewal, particularly replacement with a parking garage, high-rise housing and modern, upscale retail. People of city neighborhoods and citizen preservation activists struggled through the 1960s, culminating in 1971 with 2 to 1 passage of a citizen initiative for protection and citizen oversight of the core Pike Place Market that has since largely protected the neighborhood. George Rolfe, the first director of the Pike Place Market Preservation and Development Authority (PDA), played a key role in the economic revitalization of the Market after it was saved by the 1971 referendum. It was under his management that the direction of automobile traffic on Pike Place was reversed and the pedestrian-friendly brick paving was introduced. Rolfe also emphasized the construction of pedestrian routes to the waterfront so that the Market became the center of a pedestrian network. 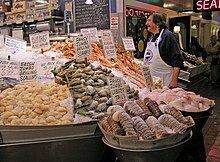 For many years, Sol "The Cod Father" Amon of Pure Food Fish has been the longest-tenured vendor at Pike Place Market. His father, Jack Amon, began selling fish in the Market in 1911 as a partner in the Philadelphia Fish Market. From about 1920 to 1935, he owned and operated the American Fish Company. In 1951 he bought the Pure Food Fish Company (founded 1917–1918), which Sol Amon largely took over in 1956. Sol had worked in the Market since 1947 and has been sole proprietor of Pure Food Fish since his father's death in 1966. He can often be seen outside his stall chatting with visitors and helping them choose their fish, including a brisk tourist trade in salmon packed to travel. The Seattle City Council honored him in 2006 on the 50th anniversary of his taking over the business: they named him "King of the Market" and permanently designated April 11 as Sol Amon Day. Amon is a longtime major supporter of the Market Foundation. On the first Sol Amon Day in 2006, Amon donated all of the day's profits from Pure Food Fish to the foundation. Walter DeMarsh of Mobeta Shoes has made custom shoes for people with foot disfigurements and deformities since 1979. Few of the historic buildings in the Pike-Market neighborhood (and none of the Market buildings as such) are individually designated as landmarks or registered as historic places. Buildings included in the federally and locally designated historic districts gain most of the benefits that would accrue from individual designation, so there is little reason to go through the difficult process of obtaining separate designation. Pike Place Market, looking southwest on Pike Street from First Avenue. The building at right with the "Meet the Producer" sign is the Leland Hotel, surrounded by the Main Arcade. Left of the Market's neon sign is the LaSalle Hotel. At extreme left is part of the Economy Market. The Market began on a boardwalk adjacent to the 3-story Leland Hotel (1900, architect unknown). The Leland was incorporated in 1907 by engineer John Goodwin into the Main Arcade. In 1914–1915 he and architect Andrew Willatsen extended this complex further into the Fairley Building, which includes Lowell's, the Athenian, and the "Down Under". The complex was rehabilitated in 1977 by George Bartholick. As of 2008, the upper two stories of the Leland continue to be housing. Together, all of these constitute today's Main Market. The two-story Triangle Market (Thompson & Thompson, 1908; rehabilitation by Fred Bassetti & Co., 1977) originally housed the South Park Poultry Company. The 1977 rehabilitation joined it with the adjacent 3-story Silver Oakum Building (unknown, 1910; Bassetti, 1977). The Outlook Hotel (now LaSalle Hotel; architect unknown; rehabilitation by Bartholick, 1977) also dates from 1908. A legitimate seaman's and workingman's hotel until 1942, its Japanese American operators Rosuke and T.K. Kodama were forcibly interned during World War II. Nellie Curtis took it over, changed the name, and ran it as a brothel into the 1950s. Since 1977 the building has been joined to the adjacent Cliff House (c. 1901), and largely devoted to low-income housing. Shops and the Market PDA office are on the ground floor. Its roof provides outdoor seating for the restaurant Maximilien. The Sanitary Market (Daniel Huntington, 1910; reconstructed 1942, McClelland and Jones; rehabilitated and extended 1981, Bassetti Norton Metler) reputedly was so named for its innovation at the time, that no horses were allowed inside. A fire on December 15, 1941, eight days after the attack on Pearl Harbor, severely damaged the building. Although the true cause of the fire was never determined, newspapers at the time speculated that the Japanese were to blame. The building was reconstructed as a 2-story building with rooftop parking. Nearly four decades later the parking lot was eliminated, replaced by two floors of residences. Place Pigalle sits atop the LaSalle Hotel. The North Arcade (1911 and 1922, John Goodwin; rehabilitation by Bartholick, 1977) constituted a major northward extension of the Main Market, extending it 1,200 feet (370 m) to the northwest and adding 160 covered stalls. The 3-story Corner Market building (Harlan Thomas & Clyde Grainger 1912; rehabilitation by Karlis Rekevics, 1975) sits on the right as one enters the Market along Pike Street. In its early years it included daystalls, and the businesses facing onto First Avenue were open-fronted. The Three Girls Bakery, the first known business in the Corner Market, is now located in the adjacent Sanitary Market. 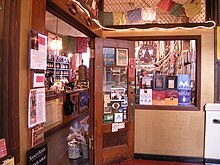 The basement was home to Patti Summers' jazz club for over two decades before becoming Can Can in 2006; the building is also home to anarchist bookstore Left Bank Books, as well as numerous other businesses. Across Pike Street from the Corner Market is the Economy Market (unknown, 1900, as Bartell Building; remodeled by John Goodwin & Andrew Willatsen 1916; rehabilitation by Bartholick, 1978). The 1978 rehabilitation occurred in conjunction with the construction of the adjacent South Arcade at the corner of First Avenue and Union Street (Olsen / Walker, 1985). The South Arcade lies outside of the protected historic Market areas. It includes condominium apartments, but also the Pike Pub & Brewery and several other retail businesses of a similar character to those within the Market boundaries. Its owner, Harbor Properties, describes it a "adjacent to" the Market. The Joe Desimone Bridge once connected the North Arcade to the now-demolished Municipal Market Building. It now contains craft-priority daystalls. The Joe Desimone Bridge across Western Avenue originally connected the North Arcade to the Municipal Market Building (unknown, 1922 or 1924; demolished after a 1974 fire). The bridge is now enclosed on three sides (1985, James Cutler Architects) and used for craft-priority daystalls. Other old buildings in the Market include the Champion Building (unknown, 1928; rehabilitation by the Champion/Turner Partnership 1977), originally a garage for the Dollar Cab Company, then a meat packing company, now ground floor retail with offices above; the Soames-Dunn Building (unknown, 1918; rehabilitation by Arne Bystrom 1976), once home to Dunn's Seeds and Soames Paper Company (who supplied paper bags to farmers selling in the Market), now retail, including the "original" Starbucks; Stewart House Hotel (unknown, 1902–1911; rehabilitation by Ibsen Nelson & Associates, 1982), a former workingmen's hotel, now retail and low-income housing; Seattle Garden Center (W. C. Geary, 1908; Art Deco details added 1930s; rehabilitation and addition, Arne Bystrom 1976) was once the Gem Egg Market and now houses Sur le Table; and the Fix-Madore Building (1916, unknown; rehabilitation by Bumgardner Partnership 1979), now an office and retail building on the west side of Western Avenue, connected to the Main Market by a footbridge. Newer buildings in the Market include the Post Alley Market at First and Pine (Bassetti Norton Metler, 1983), the Inn at the Market (Ibsen Nelson & Associates, 1985); and The Pike and Virginia Building (Olson/Walker, 1978); and the Market Heritage Center (Scot Carr & Thomas Schaer, 1999). All of these echo at aspects of the architecture of the historic Market buildings. 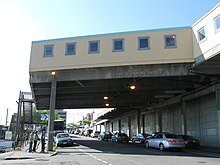 The Pike Hill Climb (Calvin and Gorasht, 1976) connects the Market to the waterfront; it occupies the same corridor that once (roughly 1911–1935) held a wooden overpass used by farmers to bring produce up to the Market after arriving by boat. The Butterworth Building. At left, a portion of the Alaska Trade Building can also be seen, and at right the Smith Block (which dates from 1906 but is not a listed building). The three buildings were jointly restored by Ralph Anderson & Partners in 1977. Along the southwest side of First Avenue, within the present-day historic district but outside of the original Market, the Alaska Trade Building (1915), 1915–1919 1st Avenue and the Late Victorian style Butterworth Building (originally the Butterworth mortuary, 1903), 1921 1st Avenue, are both listed in the National Register of Historic Places (NRHP). Outside the historic districts but within the City Clerk's definition of the Pike-Market neighborhood are the J. S. Graham Store (1919, designed by A. E. Doyle), 119 Pine Street; and the U.S. Immigration Building (1915), 84 Union Street. Other NRHP-listed buildings near the Market but outside of those boundaries include the Guiry and Schillestad Building (Young Hotel or Guiry Building 1903, Mystic Hotel or Schillestad Building 1908), 2101–2111 1st Avenue; the Renaissance-style New Washington Hotel (now Josephinum Hotel, built 1900–1949), 1902 Second Avenue; and the Moore Theatre and Hotel (1907), 1932 2nd Avenue. Also in the Pike-Market neighborhood but outside the historic districts are at least two city-designated landmark not on the NRHP: the Terminal Sales Building (1923–1925), 1932 1st Avenue; and Pier 59, now home to the Seattle Aquarium. The Moore Theatre (1907) on the corner of 2nd Avenue at Virginia Street is the oldest still-active theater in Seattle. The Seattle Aquarium (1977) is on the waterfront at Pier 59. In 1979 an OMNIMAX theatre (now Seattle IMAXDome) opened at the Aquarium, at the time one of only about half a dozen in the world. The theater is an early tilted dome iteration of IMAX. Besides Pier 59 (built 1893; pier shed built 1905), the nearby waterfront includes the turn-of-the-century piers 57 (built 1902), 62 (built 1901), and 63 (built 1905). The city purchased Piers 57–61 in 1978 after the central waterfront had been abandoned by freight shipping for years, supplanted by container shipping. Pier 58 was removed to build Waterfront Park, and Pier 57 was traded in 1989 for Piers 62 and 63. The latter two piers had long since lost their sheds (which were similar to the one on Pier 59). For many years they were the site of the Summer Nights at the Pier concert series, but the "aged and deteriorating" piers can no longer handle the weight of a stage and a crowd. As of 2006, the city is considering plans to replace these piers. Historic Piers 60 and 61 were removed for successive aquarium expansions. ^ World's Most Visited Tourist Attractions. Travel & Leisure Magazine, November 10, 2014. http://www.travelandleisure.com/slideshows/worlds-most-visited-tourist-attractions/34 Accessed May 8, 2015. ^ a b c "About the Seattle City Clerk's On-line Information Services". Information Services. Seattle City Clerk's Office. 2006-04-30. Retrieved 2006-05-21. ^ Pike Place Public Market Historic District, Seattle: A National Register of Historic Places Travel Itinerary, National Park Service. Accessed online 2 October 1980. ^ a b Pike Place Market Historical District, Seattle Department of Neighborhoods. Accessed online 7 October 2008. 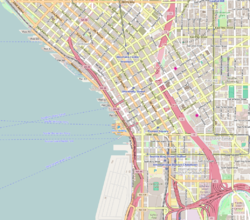 ^ Pike Place Market Historical District map, Seattle Department of Neighborhoods. Accessed online 2 October 2008. ^ a b c d e f g h i j k l Crowley 1999. ^ Thomas Street History Services 2006, pp. 11, 41. ^ Chapter 2: Executive Order 9066 in Tetsuden Kashima and the United States Commission on Wartime Relocation and Internment of civilians, Personal Justice Denied: Report of the Commission on Wartime Relocation and Internment of Civilians, University of Washington Press, ISBN 0-295-97558-X. Reproduced online on the site of the National Park Service. Accessed online 14 October 2008. ^ Korematsu v. United States dissent by Justice Owen Josephus Roberts, reproduced at findlaw.com, Retrieved 12 September 2006. ^ Brodkin 2001, p. 380. ^ a b Mark Worth, Daystalled again, Seattle Weekly, May 27, 1998. Accessed 10 October 2008. ^ Victor Steinbrueck Park, Seattle Parks and Recreation. Accessed 15 October 2008. ^ a b Jones 1999, p. iv (p. 8 of PDF). ^ Jones 1999, passim, especially iv, 19 (p. 8, 31 of PDF). ^ 100 Years, 100% Seattle Archived 2007-09-15 at the Wayback Machine, Pike Place Market, 2007. Accessed online 1 February 2008. ^ Pike Place Market, Seattle Channel. Accessed 13 October 2008. ^ "Property-tax increase for Pike Place Market upgrades added to ballot". The Seattle Times. 2008-07-15. Retrieved 2017-05-09. ^ "Renovations done, Pike Place Market beckons". The Seattle Times. 2012-04-26. Retrieved 2017-05-09. ^ Public Development Authorities Archived 2006-10-01 at the Wayback Machine, City of Seattle. Accessed online 6 October 2008. ^ a b c Market organizations, official Pike Place Market site. Accessed online 6 October 2008. ^ a b c Organizations Directory, Pike Place Merchants Association. Accessed online 6 October 2008. ^ a b Mission Statement, Pike Place Merchants Association. Accessed online 6 October 2008. ^ Kathy Mulady, Pike Place Market's money woes cancel annual Memorial Day festival, Seattle Post-Intelligencer, May 28, 2004. Accessed online 7 October 2008. ^ Home page, Pike Market Performers' Guild official site. Accessed online 7 October 2008. ^ Meet the Members of the Pike Market Performers' Guild, Pike Market Performers' Guild official site. Accessed online 7 October 2008. ^ Preliminary Guide to the Friends of the Market Records 1963–1971, University of Washington Libraries Special Collections. Accessed online 7 October 2008. 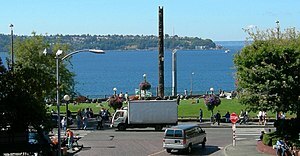 ^ Museums + Attractions Near Pike Place Market in Seattle, wheretraveler.com. Accessed online 7 October 2008. ^ a b c Market Foundation Archived 2013-06-19 at the Wayback Machine, official Pike Place Market site. Accessed online 6 October 2008. ^ Eskenazi, Stuart (2008). "Pike Place Market becoming less-fertile ground for farmers". Seattle Times. Retrieved 2007-05-27. ^ Housing, Pike Place Market official site. Accessed online 12 October 2008. ^ Medical Clinic, Pike Place Market official site. Accessed online 12 October 2008. ^ Senior Center, Pike Place Market official site. Accessed online 12 October 2008. ^ Food Bank, Pike Place Market official site. Accessed online 12 October 2008. ^ Childcare, Pike Place Market official site. Accessed online 12 October 2008. ^ Travis Mayfield, Starbucks Siren Takes It All Off, KOMO News, Aug 30, 2006, updated Aug 31, 2006. Accessed July 21, 2016. ^ The Starbucks Logo – A Visual Twist of Starbucks History, Gourmet Coffee Zone. Accessed online 16 October 2008. ^ The History of Seattle's Best..., Starboards Coffee Kiosk. Accessed online 15 October 2008. ^ Judd Slivka, Canadian May Head the Pike Market: Carole Nixon would replace Shelly Yapp, Seattle Post-Intelligencer, October 6, 1999. Accessed online 17 October 2008. ^ Connie McDougall, Gift shopping at the Pike Place Market is an adventure, Seattle Times, December 11, 2003. Accessed online 17 October 2008. ^ Maggie Dutton, Don't Apothecary Yourself, Seattle Weekly, August 13, 2008. Accessed online 17 October 2008. ^ Market Spice Tea, Design Emporium. Accessed online 17 October 2008. ^ Tom Stockley, Jamaican Spice—Cooking That'll `Jerk' Your Palate, Seattle Times, January 15, 1995. Accessed online 17 October 2008. ^ John Livingston, "Porcine Birthdays Reminiscent of Swine Times", Pike Place Market News, March 2006, p. 12. Accessed 16 October 2008. ^ "Rachel", Community Resources Archived 2013-06-19 at the Wayback Machine, Pike Place Market official site. Accessed 16 October 2008. ^ Mark Rahner Pigs on Parade: Pigmalion, Pigasso, even a Disco Pig, Seattle Times, January 12, 2001. Accessed online 14 October 2008. ^ Rebekah Denn, Children make their own 'Pigs on Parade', Seattle Post-Intelligencer, December 11, 2001. Accessed online 14 October 2008. ^ Madeline McKenzie, Pigs on Parade to kick off Market centennial celebration, Seattle Times, May 31, 2007. Accessed online 14 October 2008. ^ Pigs on Parade Auction, October 12, 2007, Pike Place Market official site. Accessed online 14 October 2008. ^ Baby Gramps can be seen playing in the Market in the 1984 documentary Streetwise. ^ M. L. Lyke, Making a joyful noise about street music, Seattle Post-Intelligencer, September 16, 2002. Accessed online 17 October 2008. ^ Monica Guzman, Meet your buskers: Cool cat, little instrument, The Big Blog / Seattle Post-Intelligencer, April 3, 2008. Accessed online 17 October 2008. ^ "The Best Buskers In Seattle". cbslocal.com. 27 February 2012. ^ Fund Set Up For Blind Woman, Victim Of Fire, Seattle Times, August 4, 1990. Accessed online 17 October 2008. ^ Kirsten Anderberg, Free Speech Costs $25 in Seattle's Public Market, self-published on resist.ca. Accessed online 17 October 2008. ^ Mother Zosima, Bard's Cathedral. Accessed online 17 October 2008. ^ Front Page Fodder, Belltown Messenger, November 2005. Accessed online 17 October 2008. ^ a b c d "Fifth Annual Buskers’ Festival", Pike Place Market News, Volume 32, Issue 9, September 2006, p. 9. Accessed online 17 October 2008. ^ Brian J. Barr, The Tallboys, Seattle Weekly, December 27, 2006. Accessed online 17 October 2008. ^ Gene Stout, Meet Vince Mira, the Reincarnation of Johnny Cash, Seattle Post-Intelligencer, February 26, 2008. Accessed online 17 December 2008. ^ Amber Tide Quotes and Bios, originally on ambertide.home.comcast.net, archived 26 December 2003 on the Internet Archive. Accessed online 17 October 2008. ^ Kathy Mulady, Jim Hinde, 1951–2008: Market busker sang his heart out, Seattle Post-Intelligencer, June 11, 2008. Accessed online 17 October 2008. ^ PK Dwyer, Seattle Post-Intelligencer Seattle Noise. Accessed online 17 October 2008. ^ The Comedy/Varietè Artists, Moisture Festival 2009. Accessed online 17 October 2008. ^ Orville Johnson biography, orvillejohnson.com. Accessed online 17 October 2008. ^ Elenga 2007, p. 156 gives the 1908 date for the founding of the Virginia Inn as the Virginia Bar. Some other sources such as Cody Ellerd, , NWSource/Seattle Times, April 22, 2008, accessed online 15 October 2008, state in passing that it dates back to 1903. Clark Humphrey (2007), Seattle's Belltown, Arcadia Publishing, ISBN 0-7385-4816-2, p. 82 says 1910. ^ a b c Nancy Leson, Enduring Quality, Seattle Times Dining Out in 2001. Accessed online 15 October 2008. ^ Rastaurants A-D, Seattle Weekly, April 23, 2003. Accessed online 15 October 2008. ^ Julien Perry, Three Girls Bakery, KOMO News, June 17, 2005 (updated August 31, 2006). Accessed 21 July 2016. ^ Neal Schindler, Behind the Pink Door, Seattle Weekly, August 06, 2003. Accessed online 15 October 2008. ^ Darby Reed, Pink Door, Seattle Weekly, July 27, 2005. Accessed online 15 October 2008. ^ Neal Schindler, The Tastemaker, Seattle Weekly, June 2, 2004. Accessed online 15 October 2008. ^ (Home page), Lowell's official site. Accessed online 15 October 2008. ^ Maximilien, Fodors. Accessed online 15 October 2008. ^ Nancy Leson, Legendary Maximilien is still the place to indulge – especially for lunch, Seattle Times, February 16, 2001. Accessed online 15 October 2008. ^ Braiden Rex-Johnson & Tom Douglas (2003), Pike Place Market Cookbook: Recipes, Anecdotes, and Personalities from Seattle's Renowned Public Market, Sasquatch Books, ISBN 1-57061-319-2. p. 76. ^ a b Joe Desimone, The Desimone Connection to the Pike Place Market, Pike Place Market official site, July 25, 2007. Joe Desimone who wrote this piece is Giuseppe's grandson and Richard's son. Accessed online 12 October 2008. ^ Erik Lacitis, Selling fish still his "first love", Seattle Times, May 1, 2007, reproduced on FreshSeafood.com, accessed 1 February 2008. ^ "King Gets His Day", Pike Place Market News, April 2006, Pike Place Market Merchant Association, p. 2. Accessed online 1 February 2008. ^ Emmett Watson, Tale Of One Of Seattle's Most Famous Faces Is No Fish Story, Seattle Times, December 27, 1990, reproduced on FreshSeafood.com, accessed 12 October 2008. ^ John Livingston, "Maximilien: Another Amazing Market View", Pike Place Market News, Volume 32, Issue #8, August 2006, p. 7. Accessed online 10 October 2008. ^ Fire at Corner Market Building, Pike Place Market, Seattle, 1941, Digital Collections, University of Washington Libraries. Accessed 10 October 2008. ^ Tizzy Asher, The Club Scene: Can Can opens in Patti Summers' former jazz joint, Seattle Post-Intelligencer, March 10, 2006. Accessed 10 October 2008. ^ Katherine Sather, Yes, you can Can Can, NWsource / Convergence Zone / Seattle Times, March 17, 2006. Accessed 10 October 2008. ^ South Arcade, Harbor Properties. Accessed online 2 October 2008. ^ Seattle Central Waterfront Park Planning Feasibility Study, Seattle Parks and Recreation, undated (approximately August 2005), p. 63 (p. 73 of PDF). Part of Pier 62–63 Piling Replacement and Central Waterfront Park Planning Process. Accessed online 12 October 2008. ^ Paul Dorpat, Seattle Central Waterfront Tour, Part 8: The Seattle Aquarium and Vicinity, HistoryLink, May 24, 2000. Accessed online 14 October 2008. 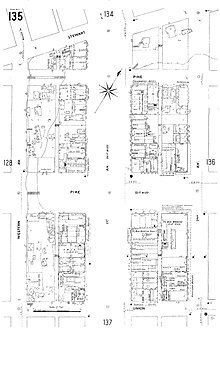 ^ a b Reference for date of Alaska Trade Building, Butterworth Building, J. S. Graham Store, Terminal Sales Building: Crowley & Dorpat 1999, pp. 88, 108. ^ Reference for date of Butterworth Building: Stuart Eskenazi, Ghost stories haunt Pike Place Market, Seattle Times, June 25, 2007. Accessed online 3 October 2008. ^ Reference for date of U.S. Immigration Building: Immigration Bldg/Longshoreman's Hall, Maritime Heritage Network. Accessed online 3 October 2008. ^ Reference for date of Guiry and Schillestad Building: Context Statement: The Central Waterfront, Historic Preservation Program, Department of Neighborhoods, p. 31. Accessed online 3 October 2008. ^ Reference for date of the Josephinium: Paul Dorpat, A Second Chance, Seattle Times, June 19, 2005. Accessed online 3 October 2008. ^ Reference for date of the Moore: History of Moore Theatre, Moore Theatre official site. Accessed online 3 October 2008. ^ Individual Landmarks (and the A–Z links), Landmarks and Designation, Department of Neighborhoods, City of Seattle. Accessed online 28 December 2007. ^ Reference for date completion of Terminal Sales Building, Terminal Sales Building, SkyscraperPage.com. Accessed online 3 October 2008. ^ Seattle Aquarium Society Annual Report 2004 Archived 2008-10-28 at the Wayback Machine, p. 12. Accessed online 14 October 2008. ^ The History of Pier 57 Archived 2008-09-24 at the Wayback Machine, pier57seattle.com. Accessed online 14 October 2008. ^ Harriet King, For Seattle, a Wave of Harbor Projects, New York Times, September 1, 1991. Accessed online 18 October 2008. ^ Paul Dorpat, Roots In The Water, Seattle Times Pacific Northwest Magazine, January 21, 2007. Accessed online 16 October 2008. ^ William Dietrich, Port Reform, Seattle Times Pacific Northwest Magazine, May 1, 2005. Accessed online 16 October 2008. ^ Piers 62 and 63, Seattle Parks and Recreation. Accessed online 15 October 2008. Brodkin, Karen (2001), "Diversity in Anthropological Theory", in Susser, Ida; Patterson, Thomas Carl (eds. ), Cultural Diversity in the United States: A Critical Reader, Blackwell Publishing, ISBN 0-631-22213-8 . Crowley, Walt (1999-07-29), Pike Place Market (Seattle)—Thumbnail History, HistoryLink.org, retrieved 2006-07-21 . Crowley, Walt (1978), National Trust Guide Seattle, New York: Preservation Press, John Wiley & Sons, Inc. .
Crowley, Walt; Dorpat, Paul (1998), National Trust Guide Seattle, New York: National Trust for Historic Preservation in the United States / John Wiley & Sons, Inc., ISBN 0-471-18044-0 . Elenga, Maureen R. (2007), Seattle Architecture, Seattle: Seattle Architecture Foundation, ISBN 978-0-615-14129-9 . Evans, Jack R. (1991), Little History of Pike Place Market, Seattle: SCW Publications, ISBN 1-877882-04-6 . Flom, Eric L. (2002-06-20), Moore Theatre (Seattle), HistoryLink.org, retrieved 2006-07-21 . Jones, David G. (1999-12-08), Management Review of the Pike Place Market Preservation and Development Authority (PDF), Office of the City Auditor, archived from the original (PDF) on 2008-10-28, retrieved 2008-10-07 . Jones was Deputy City Auditor at the time of publication. Lange, Greg (1 January 1999, lead paragraph updated 2006), Seattle's Pike Place Market opens on August 17, 1907, HistoryLink.org, retrieved 2006-07-21 Check date values in: |date= (help). Lehmann, Thelma (2001-10-25), Masters of Northwest Art: Mark Tobey—Guru of Seattle Painters, HistoryLink, retrieved 2006-04-21 . Rewrite of work originally published in Hans and Thelma Lehmann, Out of the Cultural Dustbin: Sentimental Musings on the Arts & Music in Seattle from 1936 to 1992 (Seattle: Lehmann, 1992), 73–75. NRHP (2006), WASHINGTON – King County, National Register of Historic Places, retrieved 2006-07-21 . Link is to first of 5 pages. "Alaska Trade Building" (added 1971) and "Butterworth Building" (added 1971) are on p. 1 of 5. "Guiry and Schillestad Building" (added 1985) is on p. 2 of 5. "Moore Theatre and Hotel" (added 1974) and "New Washington Hotel" (added 1989) are on p. 3 of 5. Phelps, Myra L. (1978), Public works in Seattle, Seattle: Seattle Engineering Department, ISBN 0-9601928-1-6 . Pike Place Market (2008-03-25), Daystall Rules and Regulations (PDF), Pike Place Market, archived from the original (PDF) on 2008-10-28, retrieved 2008-10-09 . Shenk, Carol; Pollack, Laurie; Dornfeld, Ernie; Frantilla, Anne; Neman, Chris (2002-06-26, maps .jpg c. 2002-06-15), "About neighborhood maps", Seattle City Clerk's Office Neighborhood Map Atlas, Office of the Seattle City Clerk, Information Services, retrieved 2006-04-21 Check date values in: |date= (help). Shenk et al. provide a substantial bibliography with extensive primary sources. Seattle City Clerk (2006-04-30), "About the Seattle City Clerk's On-line Information Services", Information Services, Seattle City Clerk's Office, retrieved 2006-05-21 . See heading, "Note about limitations of these data". Speidel, William C. (1967), Sons of the profits; or, There's no business like grow business: the Seattle story, 1851–1901, Seattle: Nettle Creek Publishing Company, ISBN 0-914890-00-X . Also ISBN 0-914890-06-9. Speidel provides a substantial bibliography with extensive primary sources. Wikimedia Commons has media related to Pike Place Market. Guide to the Department of Community Development's Pike Place Market Records 1894–1990, Washington State University. Guide to the Pike Place Market Visual Images Collection 1894–1984, Washington State University. Guide to the Pike Place Market Historical District Records 1971–1989, Washington State University.